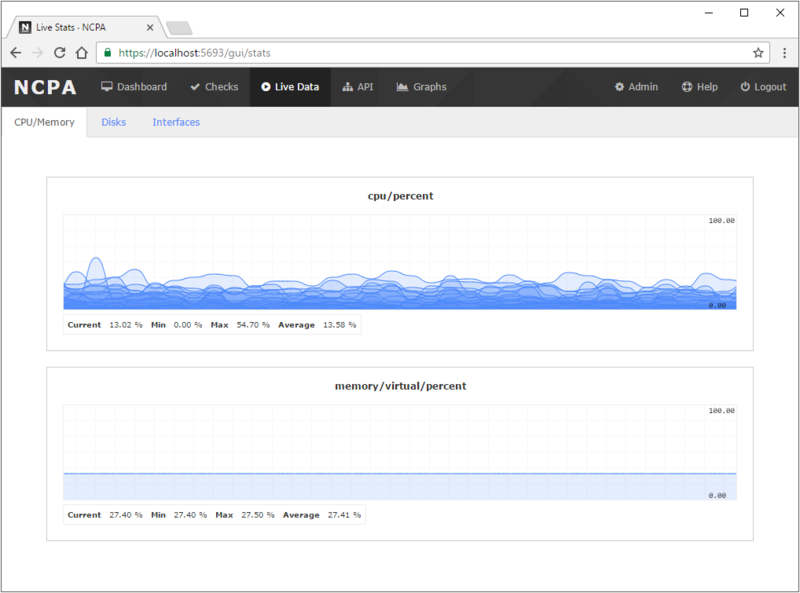 Live stats using real-time graphing API - The live stats tab is an example of the NCPA real-time graphing API via websockets and a way to view real-time cpu, memory, disk, and interface details. They can also be integrated with Nagios XI or called via the API. Learn and test API calls - All installs of NCPA come with an API browser accessible via the integrated web GUI. Learn how to use the API and test your custom plugins and checks before using them in production. The browser provides tool-tip info and can create check examples. Real-time top processes - Much like the top command in Linux systems, this shows a similar list of the top processes running on any OS from inside the NCPA web GUI. To use this page, your browser must support websockets. Integrated help documentation - Read the entire documentation for NCPA directly from any NCPA web GUI, allowing you to find out how to use certain sections you may still have questions about. The help is fairly comprehensive but we are always working on improving it! New to NCPA? 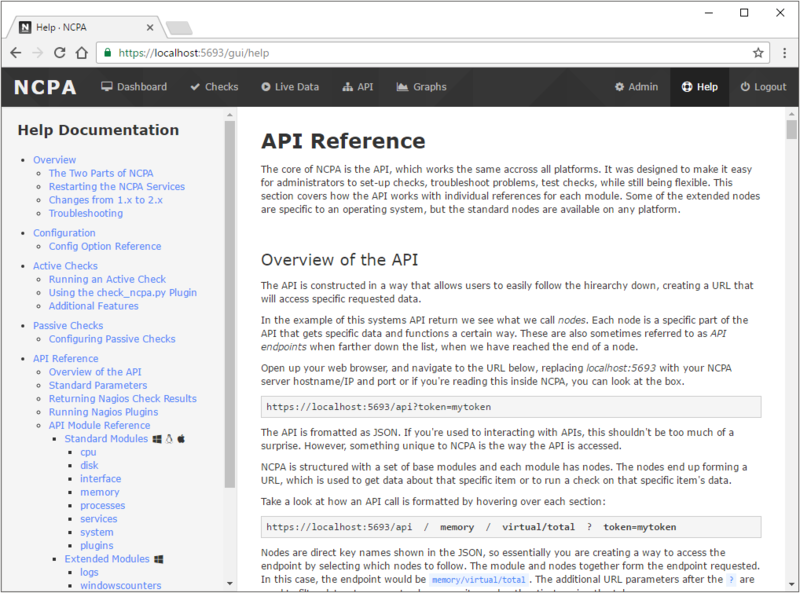 See some of the awesome features present in the Web GUI and API, available on any operating system. NCPA is written in Python and is able to run on almost any Operating System. We build official binaries for Windows, Mac OS X, and various Linux flavors. Both types of checks can utilize API endpoints and custom plugins. Active checks can be ran using the check_ncpa.py Nagios plugin. Passive checks can send to any NRDP server. One of the core components in NCPA is the Web GUI. 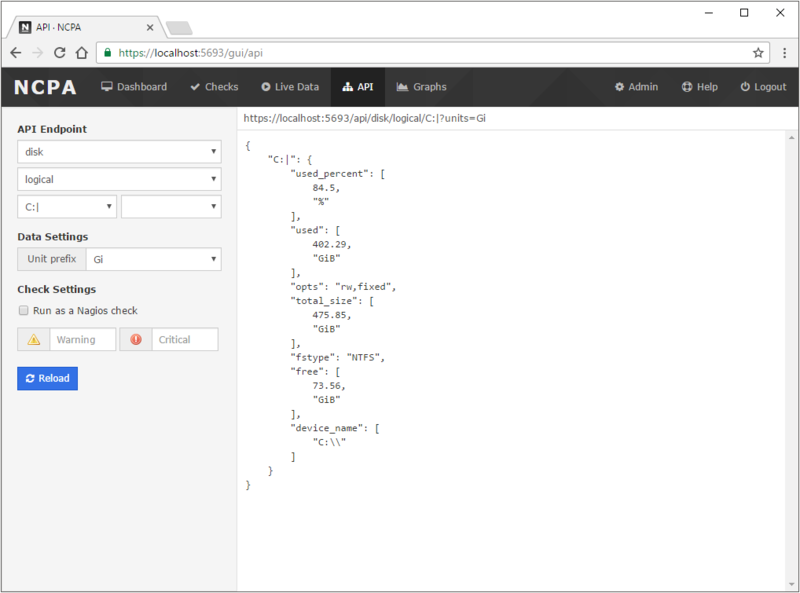 Using the Web GUI, you can browse the API, read the docs, view system information, configure, and generate graphs. Adding your own custom plugins to NCPA means you can run your Nagios compatible plugins with ease any way you want; via the API, as an active check, or as a passive check. One of the awesome features of NCPA is the ability to graph real-time server statistics. Most of the general server system info can be graphed in real-time. We compile and bundle all the required dependencies for NCPA into libraries to create a single installable agent. This includes Python and all the modules required. Latest stable agent version - 2.1.6 · View the changelog to see a list all features and bug fixes. Don't see your version of OS on this list? Request it on GitHub or help us build for it! This is new and may not work 100%. Please let us know of any bugs on github. Download the plugin, older versions, and development versions. Download the older versions of NCPA. Access the latest dev builds. These builds are not meant for production. Want to see NCPA in action? 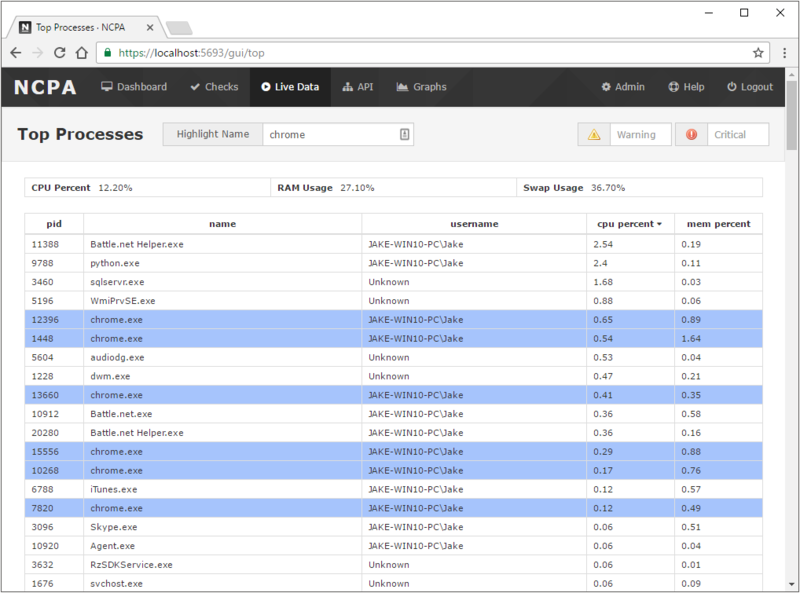 Start using NCPA to monitor your own environment with this quick-start guide. Read the help documentation that comes standard in the NCPA. You can also view this in any NCPA GUI by clicking the Help tab. Here are some links to documents that relate to NCPA that are more in-depth than the getting started guide. Can I use NCPA with Nagios Core? Of course! While we built NCPA with Nagios XI in mind (due to some awesome integration via the NCPA config wizard) but the agent can send passive checks to Nagios Core or use our check_ncpa.py plugin to run active checks from Nagios Core. Why did you choose Python? Python is a very flexible language. It can be used on most operating systems and when we wanted to be able to run our binaries without any requirements, it's modular layout pairs perfectly with it's small footprint. Python also has a large community and is a very popular language. The quickest way to get in contact with the developers is by creating an issue on the project's GitHub issues page. Try to be as descriptive as possible so we can reproduce the bug and fix it. I read your license, can I fork the NCPA GitHub repo to make a pull request? While the Nagios Open Source Software License may seem rather restricting, we want to work together by collaborating with the community. You may fork the NCPA GitHub repository to contribute to the development of NCPA. However, you cannot fork the code to create a competing product. It's been a while since the last update, is the project still being developed? Yes, it is. You may have noticed that NCPA has periods of active daily development and periods where there may be hardly any development from the Nagios developers. This is a true open source project for the Nagios developers and we don't normally work on it during the business work day. We are normally busy making cool new features and squashing bugs in the variety of enterprise monitoring products that Nagios Enterprises offers. This means 95% of all NCPA development is done on the developer's own time. With that said, we will try to respond to any issues on GitHub as quickly as possible, so don't be shy. The origins of NCPA can be traced back to the 2012 Nagios World Conference, where a network admin stated, "I have no idea why agents are so difficult". After reflecting on the statement, we had no answer. The idea for NCPA to be a single monitoring agent that was secure, simple, and easy to manage was formed. In 2014, the first version of NCPA was released with the basic features that are core to the project such as the cross-platform API. Today, NCPA has come a long way from the initial idea back in 2014. It includes countless extra features with many more under development. If you'd like to get involved with development, check out the contributing guide on GitHub. If you're not a developer, but would like to help in other ways, feel free to give your feedback and comments in the issues section of the project. Since NCPA 2, the RPM binaries can also be found in the Nagios repository. We recommend installing the RPM using this method if you'd like to be able to upgrade using yum in the future. RPMs via repo are currently only available for RHEL-based systems. Run the following command to install the repo release rpm which will automatically add the repository to your yum configuration. Once the repo has been added to yum, just install NCPA with the yum command. Since NCPA 2.1.3, the DEB Ubuntu binaries can also be found in the Nagios repository. We recommend installing the DEB using this method if you'd like to be able to upgrade using apt-get in the future. Once the repo has been added to apt, just install NCPA with the apt-get command. Since NCPA 2.1.3, the DEB binaries can also be found in the Nagios repository. We recommend installing the DEB using this method if you'd like to be able to upgrade using apt-get in the future.